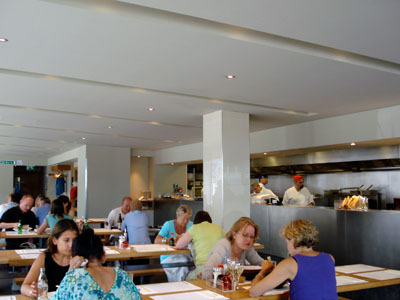 Wagamama is located in the heart of Brighton, on the British south coast. While they did make an effort to create the decor, it feel more like a cafeteria than a restaurant. The comfort is minimum as the emphasis is on practicality. Service was relatively good. While our waiter made some efforts, he was very busy as he was catering to a large number of tables. They certainly could do with a bit more staff. I ordered an Ebi Raisukaree which is a Japanese style rice dish. 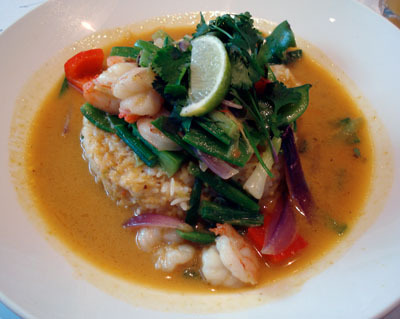 It is stir-fried black tiger prawns served on rice with a curry sauce and garnished with ginger, galangal, chilies, coriander, red peppers, green peppers, spring onions, mangetout and lime. The presentation was very good and the taste of the dish was very well balanced. One note: I would have preferred the curry sauce to be a bit thicker. That would make the dish easier to eat as the rice quickly goes apart in the sauce. Aside the Ebi Raisukaree, I ordered a fruit juice which is a fruit cocktail composed of apple, orange and passion fruit. 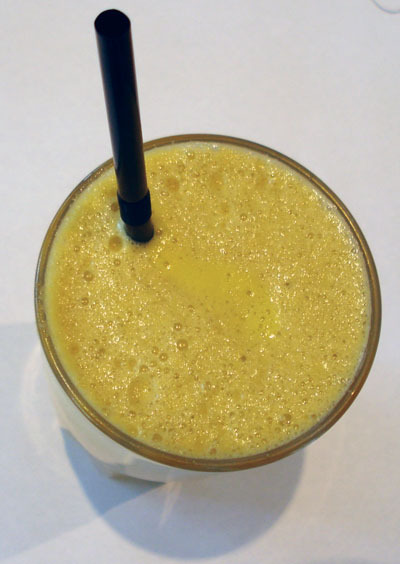 While it is very good, the orange juice dominate the mix and hide both the apple juice and the passion fruit juice. Around $30, including drinks (fruit juice) and tip. Considering the food and the current exchange rate (nearly 2 dollars for 1 pound), Wagamama offers good value for money. I will come back.